Citation Information: J Clin Invest. 2006;116(5):1159-1166. https://doi.org/10.1172/JCI28547. Autoimmune bullous disorders are a group of severe skin diseases characterized clinically by blisters and erosions of skin and/or mucous membranes. A hallmark of these disorders is the presence of IgG and occasionally IgA autoantibodies that target distinct adhesion structures of the epidermis, dermoepidermal basement membrane, and anchoring fibrils of the dermis. This Review focuses on the potential role of autoreactive T cells in the pathogenesis of these disorders. Pemphigus vulgaris (PV) and bullous pemphigoid (BP) are the best-characterized bullous disorders with regard to pathogenesis and T cell involvement. Activation of autoreactive T cells in PV and BP is restricted by distinct HLA class II alleles that are prevalent in individuals with these disorders. Autoreactive T cells are not only present in patients but can also be detected in healthy individuals. Recently, a subset of autoreactive T cells with remarkable regulatory function was identified in healthy individuals and to a much lesser extent in patients with PV, suggesting that the occurrence of autoimmune bullous disorders may be linked to a dysfunction of Tregs. Autoantigens of human autoimmune bullous skin disorders and their role in epidermal and dermoepidermal adhesion. (A) Desmosomes. The integrity of epidermal cell cohesion is largely dependent on desmosomes, plaque-like intercellular adhesion structures that connect transmembranous adhesion molecules such as the desmogleins and desmocollins with keratins of the cytoskeleton through interaction with intracellular components of the desmosomal plaque such as desmoplakin, plakoglobin, plakophilin, envoplakin, and periplakin. In addition to Dsg3 and Dsg1, which are autoantigens in pemphigus, all the other aforementioned components of desmosomes have been identified as autoantigens of different clinical variants of pemphigus. 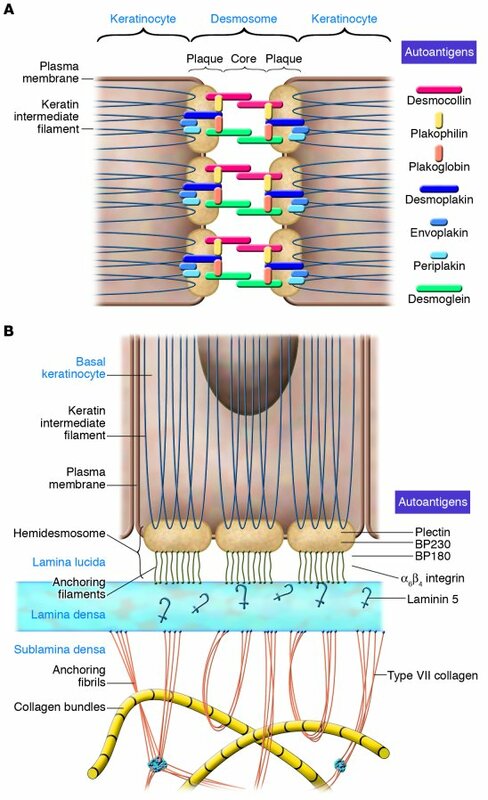 (B) Hemidesmosomes and components of the dermoepidermal basement membrane. Basal keratinocytes adhere to the basement membrane zone by the interaction of cytoplasmic and transmembranous components of hemidesmosomes, such as BP230 and BP180 and α6β4 integrin, with ligands such as laminin 5 located in the lamina lucida and lamina densa of the dermoepidermal basement membrane zone. The intracellular hemidesmosomal components BP230 and plectin are linked to keratins of the cytoskeleton and interact with the cytoplasmic domains of BP180 and α6β4 integrin, which in turn interact with laminin 5 via their ectodomains. Type VII collagen is the major component of anchoring fibrils, which link the basement membrane to interstitial dermal collagen fibers by direct interaction with laminin 5 in the lamina densa of the basement membrane. Figure modified from ref. 58.